The holiday house is surrounded by olive trees, in a rock garden of over an acre. The white stone houses stand out among the green, the red earth and blue sky. They are all decorated differently and look like small art galleries, with large paintings on the walls that give color. 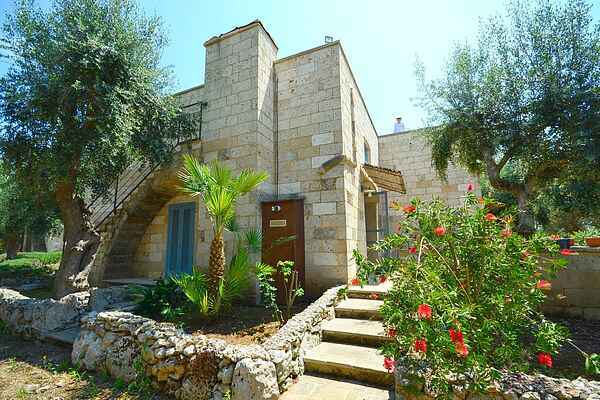 They have vaulted ceilings, colorful walls, stone floors of Trani and a built-in kitchenette, made out of metal and wood. A perfect mix of old and modern, with antique furniture. They are spacious and bright, spread over two floors in a single space. On the ground floor is the living room and a kitchenette with a comfortable sofa bed for two people (possibly single or double). On the mezzanine floor, which is accessed via a spiral staircase made of iron and stone, is a double bed. Each house has its own terrace. There are two apartments of this kind that can also be connected and rented out as a whole. In the heart of Salento, 45 km from Lecce. Both the seaside resorts of the Ionian Sea and the Adriatic coast are a short distance away. You can also choose the long sandy beaches and spectacular cliffs overlooking the sea. The houses are the ideal starting point for excursions to the main tourist resorts of Salento, such as Otranto, Gallipoli, Santa Maria di Leuca and Lecce.